We have a real roundtable this week, so I thought I would add subtitles to organize ourselves a bit. And some of these aren't quite so...brief. It was a high emotion week, I got carried away, ok?! :) But I hope that you enjoy. -1-"Mommy Look! You can download books for free on your new Nook!" I now have a tablet (yay!) but using it hasn't gone quite so smoothly (boo!). Honestly, I'd kind of prefer a working laptop (I got the tablet used), but that's another matter. I do like that you can boot this little guy up real quick to just jump on Twitter or your email, but actually getting where I want to go via clicking and typing has resulted in more than a few f-bombs, and that isn't good. As well, Henry loves the Nook, and the *instant* I had our debit card hooked up for purchases, I suddenly had Diary of a Wimpy Kid on my Nook with a sheepish-looking Henry lurking in the wings. And a scan of Barnes & Noble's FAQ's (not easily accomplished via the Nook, ironically enough) revealed a shocking fact: Barnes & Noble will NOT let you cancel ebook orders. Say *what*?! Amazon lets you cancel Kindle orders for up to a WEEK, and the reason for that is that it's pretty darn easy to purchase something with a single click when you don't mean to. One phone call to Barnes & Noble later (with a lengthy and huffy wait time endured by me) did result in a credit and instructions in how to set up password protection for purchases (and this is to protect the Nook from my *own* accidental purchases as much as Henry's), but holy smokes is that annoying. To have to *call* to take care of something like this. I'm not so impressed. But I AM excited that I'll have a tablet to take with me on my trip in a few weeks to Boston for the Catholic New Media Conference!! I can blog and Tweet y'all, even while I'm away! I feel so tech savvy! -2- "Anne do it, BY THE SELF!!" We know everything that is on Anne's mind these days. She's very verbal, she's very opinionated, and she's very LOUD. "Mommy, WHAT HAPPENED TO THAT CANDLE?! THE CANDLE, MOMMY, THE CANDLE!!" This was during Mass, at the *consecration*, just to put things into perspective. Anne was apparently on wick watch. It's Halloween costume catalog time, and this year it's more difficult than ever. Henry is having the nerve to actually *grow up* and want to segue away from the adorable and cherished superhero costumes of lore. So it's become this tug-of-war of sorts with Henry pointing out some gross, scary costume that he would like, and us saying no. But flipping over to the girls section of the catalog is enough to give any parent a heart attack. I don't need my daughter thinking that policewomen wear such scandalous outfits as the ones pictured, thank you very much. I can just imagine the "YOU'LL WEAR THAT OVER MY DEAD BODY!!!" conversation that is awaiting us 10 years from now. -4- "So, I need 3 primary sources from before the time of Christ..."
I'm exaggerating, but seriously. I have a World Civilizations class that I taught for a few weeks back and the students apparently found me very approachable. :) Since late last week I've been fielding student emails and visits about finding the sources they need. I've enjoyed it tremendously, it's been a blessing. But the past two days have been tough. Why? Well, because their due date is *today* and I had students in my office yesterday afternoon who hadn't even started yet. And a few of them were being FUSSY. I find some primary sources on their somewhat obscure topic, and they still have an "eh" look on their face.
" I don't know. I mean, I wanted something from about 100 years earlier that talked specifically about _______." Dude. When it's 4 pm the afternoon before your due date, and I'm in my office with you with my glasses on laboring away to find you primary source documents about ancient Chinese printing techniques, do *not* tell me that you wanted something "just a bit more specific on ______ sub-point." We can address that in the secondary sources, but haven't we just gone over what a primary source document IS? ARE YOU LISTENING?! Our troupe has received the new costumes, and the results are in via a flurry of beads and sequins in the studio waiting area last Friday. The smaller tops appear to actually be made to fit women who wear A or B cup bras. This, my friends, is a gigantic improvement. The DD ladies also seem to have come out ahead, but our C cups were left shaking their heads in confusion. One is so large two sets of breasts could fit in each cup, and the other is cutting off the armpit circulation of the recipient. Claire is our resident expert on Middle Eastern dance, but we also call her "The Boobadasher": she'll find a way to help you fix the top of your costume so that it modesty stays put where it's supposed to. "Karen, I think you'll be able to pull those cups together more in the front if you put some stitches in, but if you need help boobadashing, just let me know." I love how she uses it as a verb now. -6- "Oh Lord, PLEASE don't let it be yet another one of those horrible white barrels with a dissolved body inside!!" Ok, Breaking Bad talk. I'll try to be brief, because I'm attempting to least *pretend* I know the meaning of the word "quick", and so maybe I'll write a whole post on Breaking Bad next week, but I watched the finale Wednesday night and I simply HAD to talk about it. I'll say this: Breaking Bad may be the best television series I have ever watched. No other show has evoked such strong emotions in me and caused me to think about the storyline on my own time the way this one has. I have been a basket case all week about some of the things that happened in the final episodes. I think the thing that is most striking to me is how this show depicts an ordinary guy with a ho hum life making a crazy decision as a result of receiving a terminal diagnosis, and how evil creeps in, step by step by step, until suddenly you cannot recognize the character as the same person anymore. Every bad choice that he makes, both big and small, have evil consequences that eventually impact not only him, but those around him. I cried like a baby at the third to the last episode, and I cried again at the finale, and again the morning AFTER the finale just thinking back on it. Yep, that seals it: Breaking Bad post next week, either Monday or Tuesday. "All right, I gotta go. See you next month." "Can't you stay a little longer? Visit a bit?" "No, I have a long trip ahead of me..."
"I'll give you $10,000 to stay 2 more hours." - Walt, desperate for human company in his isolated (by his *own* doing) hideaway. I didn't think it was possible for me to feel sorry for Walt after what we've seen him do over the course of five seasons of this show. But when he offered a virtual stranger 10 grand just so that he wouldn't be alone with his own thoughts for even just a little longer... I cried. He made money his god, and pride was the method of worship that fed this idol, but he finally realized that he can't buy what it is that he really wants: the love and companionship of his family, and the respect of the world at large. No matter how much I came to loathe his actions, my heart ached for his emotional suffering and misguided attempt to purchase someone's attention if not their genuine affection. Every time I saw that barrel of money he guarded so carefully, and what it represented, my heart hurt. "Don't you even tell me yet again how you did this for your family!!" "You're right, I did it for *me*. I liked it. I was good at it. It made me feel alive." - Walt finally being honest with himself and his wife that he continued cooking meth not to provide for the family (although that may have been the reason he *started* doing it) but because it meant something to *him*, a man who would almost certainly die from stage 4 cancer within spitting distance of his diagnosis. She doesn't forgive him, but acceptance and understanding pass between them. "May I see her? Just one more time?" - When Walt gently strokes and whispers goodbye to a sleeping Holly, I cried like my heart was breaking, and I suppose that it was. When he got into this mess, he simply wanted to provide a future for his unborn daughter. Now he's made an unmitigated disaster of things, and he can never put the pieces back together, nor get the time back that he spent obsessing over "the business." His original desire was out of love, but his compulsion ultimately came from his ego, and THAT was the cancer that was most destructive of all. "For real, yo, this whole thing feels kind of sketchy, you know? Like...morality-wise." - I love Skinny Pete. That is all. "Ok, WAIT. Don't shoot! First just let me...*carefully puffs cigarette*"
- Uncle Jack was the person you loved to hate, and there isn't an iota of redemption in that man, but his final lines were awesome. Especially when this was followed by Uncle Jack pointing out that if Walt shot him, he'd never find the rest of the money, and Walt shooting him before he could finish the sentence. Finally, Walt realized that the money didn't matter anymore to what would bring him peace and solace. All right, that's going to have to do. More analysis next week! 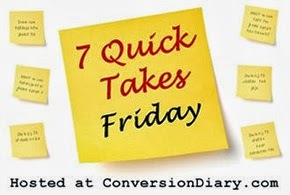 And more 7 Quick Takes over at Conversion Diary! 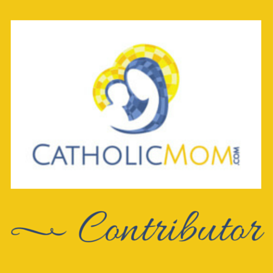 Oh, our kids could get together at Mass! Right now my youngest has taken to quacking at Mass (and other times as well). You have a far stronger stomach than I do, to have gone all the way to the end of Breaking Bad. I'm glad most fans sound pleased with the finale. Your experience with the World Civ students made me laugh, because I had very similar conversations with middle schoolers looking for science fair background information this week. But I've had these kids for the past three years now, and most of them acted totally CLUELESS! They still expect to find a book singly about their project. Then I caught one typing her hypothesis into a search engine--arrrrgh. I have done the best that I could. . .
Hi Kate, oh I FEEL FOR YOU!! You know how much time I spent going over with them how to evaluate sources and the difference between scholarly periodical literature and the free Web? And then I have a student email me: "I think these sources are fine because they're from a .edu, but I just wanted to run them by you and make sure..."
Yes, the TIME. Like this morning, when I spent 15+ minutes going over the online pathfinder for their project, and I still came across a student (one of the bright ones, mind you!) with a Wikipedia page on his screen! "Sweetie, why are you on there?" At least your students ASK YOU.